I’ve been fermenting beer in my bedroom for two reasons: 1) it’s the most reasonable place for me to waste space in our apartment and 2) the temperature is as much as 8 degrees F cooler than elsewhere in the apartment during the cold months. Spring is finally here, and while I’m grateful for the opportunity to walk around and explore new parts of the city with Colleen, my bedroom will now be too warm to ferment in. I needed a solution for keeping the beer cool in a warm room while the yeast are throwing a hotter party than a hip-hop superstar. My original idea was to use a swamp cooler. A swamp cooler is simply a pool of cool liquid that is wicked up by a towel that covers the fermenter. A fan blowing on the towel circulates dry air into which the moisture from the towel evaporates. When the water evaporates, it carries away with it some thermal energy, leaving the towel (and hence the fermenter) cooler than before. Swamp coolers can cool fermenters about 5 to 10 degrees F below ambient temperature. However, my brother dissuaded me, noting that when the weather turns humid with the heat coming in, the swamp cooler will probably be ineffective. Also, swamp coolers give very poor temperature control without hourly maintenance of the pool, swapping out ice bottles and the like. Instead I decided to build a fermentation chamber/chiller — an insulated box that keeps a lower temperature than the room in which it is placed. This concept probably sounds familiar, nay, identical to a fridge or an icebox. In fact this is a sort of high tech icebox, since the coolant will be jugs of ice placed in the box, but with temperature throughout the box controlled by a thermostat that operates a fan to circulate cold air near the ice. So why not simply buy a fridge? First of all, building things is fun. Secondly, I don’t care much for the idea of hunting down an appropriately sized mini-fridge on Craigslist, with the very real possibility that once I run out to buy it who knows where in the city, I find that my fermenter will not fit. Worse, this could happen after I buy a fridge. Thirdly, since I only want to keep the fermenter around 66 degrees F give or take a couple of degrees, the fridge thermostat would have to be modified, which is a bit intimidating to me, and I may not even have the tools to do it. Surprisingly, this project is not any cheaper than buying a used mini-fridge, and since you put stress on your freezer by asking it to freeze jugs of water, there isn’t a cost savings in your energy bill either. 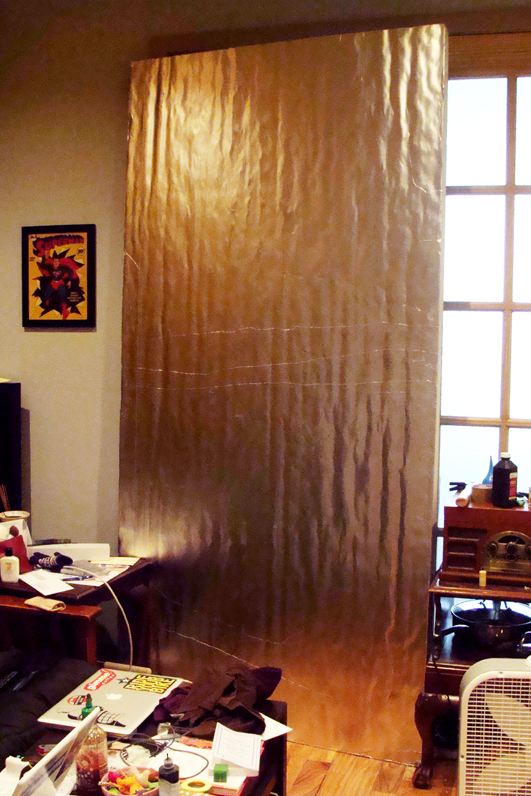 The parts involved are a 4’x8’x2″ sheet of rigid insulation, a thermostat, a computer case fan, and a 12V power supply. The last two can very likely be salvaged, but the thermostat and insulation will put you back somewhere north of $50 in all likelihood, unless you have a connection with construction. This is why you bring your cut plan to the store. The sheet of insulation was larger than my bedroom door. I picked up my insulation board at Home Depot in Bed-Stuy, which requires between two and three trains to reach from my apartment depending on which subway stations you use. I was lugging a 4’x8′ sheet of 2″ thick insulation, so I elected for the closest stops. Once again, homebrewing led me to be the least popular guy on the subway, with a board that took up nearly a third of a train car. The collective ire may have been enough to make me walk the two miles between the store and home with the board over my head, but that day it was windy, and my board was a sail that would transport the tiny boat of my body wherever the wind would blow. This poor start to things would prove to be a foul omen for the rest of the project. When I was selecting my insulation, I decided to use polyisocyanurate rather than extruded polystyrene, which is typically recommended. Polyiso has a higher R-value and contains less nasty flame retardants. However, while I was selecting a board, I noticed that most of them had heavily worn edges and the surfaces were warped. Since every single board was in this condition, I thought perhaps this was just par for the course and others who had gone before me had overcome this obstacle. That high R-value won’t be doing much good with these gaps. Once I had wrestled the boards together, it became clear that they had not. As you can see, there were gaps as large of as a half inch between some of the boards simple due to bowing and warping. Additionally, I didn’t have proper tools for measuring or cutting such a large and thick object. I made due with a ruler and a cutting mat, which I used in tandem to mark out my cuts, and sliced up the sheet with a box cutter and a paring knife. 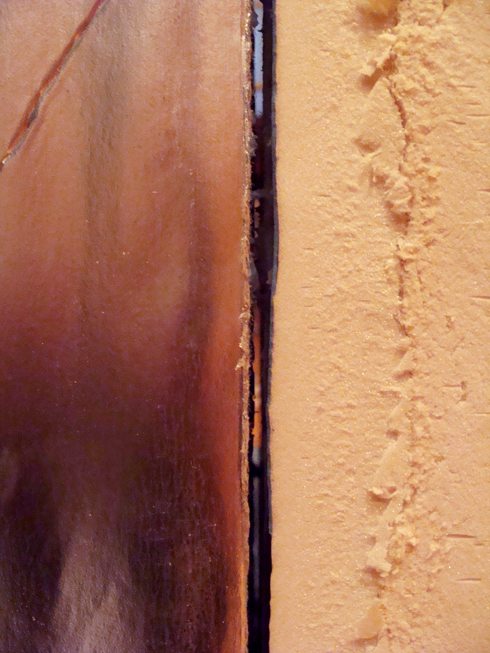 Most guides to cutting rigid insulation recommend cutting into it, and then snapping off the piece over the edge of your work surface, but (along with my ragged cuts) this method introduced deviations from the cut line by as much as a half inch. When I tried to force the lid onto the box the day after assembly, some of the glue on one of the sides gave way. Before that happened, I was beginning to conduct experiments on the heating of a 64 degree F carboy of water in our apartment, to see how much the sloppy craftsmanship of the chiller would impact its performance, but by now I’m of the opinion that this was all just a serious misstep. I’m set to return what materials I can and see if I can reuse what I can’t. Before I disassemble the box, I’ll be trying to make the most of it by putting the tripel in there with some frozen jars and cover the ensemble with a cold damp towel. This entry was posted in beer, equipment and tagged DIY, fermentation, fermentation chiller, narrative, temperature, temperature control on April 18, 2013 by Dylan Bargteil.